Create a warm, welcoming feel in your home this holiday season with the Glow Anywhere LED Christmas Tree! This spectacular illuminated resin Christmas tree can be used indoors or outdoors for a holiday that's certain to be unforgettable. Just pop in two D batteries and this durable little Christmas decoration will give off its gorgeous glow for four to six months. Use it in your bedroom as a nightlight, on the table as a centerpiece or out in the garden — it's up to you! 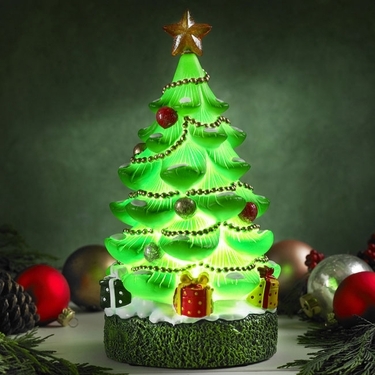 There's something special about this lighted resin Christmas tree that goes beyond its charming design. Thanks to a timer that turns the tree on at the same time each evening followed by an automatic shut-off after five hours, it's an eco-friendly decor option as well. Our delightful LED Christmas tree measures 5.5" x 11" Tall.